If you have time and the weather is good a hike up Table Mountain can be one of the most rewarding adventures in Cape Town. Take a walk up the Kasteelspoort route and you’ll be treated to magnificent views, unique photo opportunities, and a visit to the site of the old cable car. 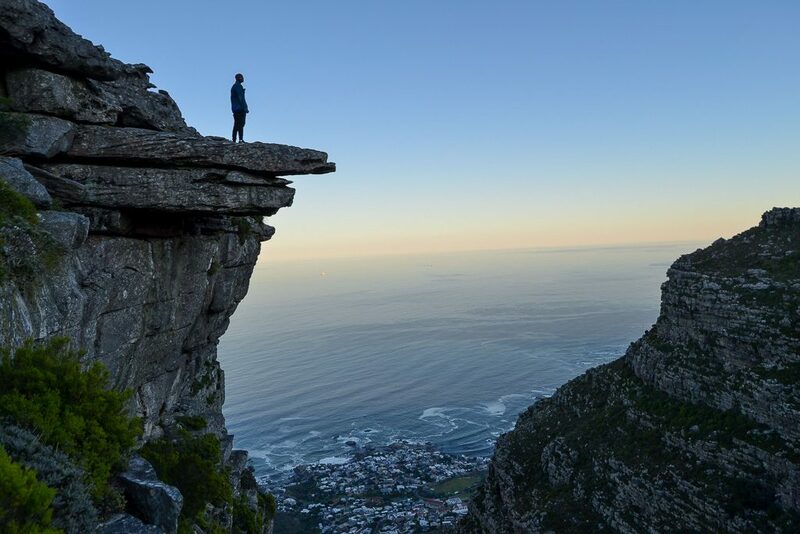 When climbing Table Mountain, one of the seven New Wonders of Nature, you’re always in for a thrilling but tough walk. For the Kasteelspoort hike, you climb up the Twelve Apostles side of Table Mountain, meaning you’ll be treated to serene views of the Atlantic Ocean and Camps Bay on a less congested route. The hike up can take anywhere between two to four hours depending on your pace. Once you’re at the top you can stop for a picnic and photos and climb back the same route. Otherwise, you can cross the Valley of the Red Gods and Echo Valley to get to the Table Mountain Aerial Cableway, which could take between one and a half and three hours depending on speed and fitness. You have two options for a starting point: you can either start with the Pipe Track (which could add between 45 minutes to an hour to your hike) or you can park in Theresa Road and walk up the Jeep Track to the Pipe Track. For the latter, you’ll take a left once you’re on the Pipe Track to get to the Kasteelspoort turn-off. You’ll walk up the mountain past incredibly beautiful fynbos plants and big golden-brown boulders. Follow the path up and up and soon you’ll start seeing the houses in Camps Bay get smaller and smaller below you. Close to the top, there is a flat lookout point where you’ll get a beautiful view of Lion’s Head. 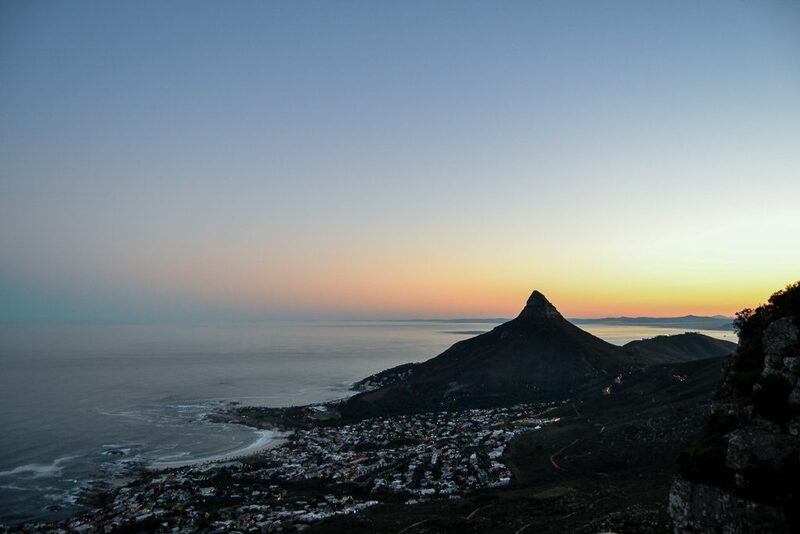 Before sunrise, you might spot dozens of little lights heading up the mountain as adventurous Capetonians and visitors start their day with a hike up Lion’s Head. It’s a picturesque walk up and you’ll want to take plenty of water breaks to enjoy the view. You’ll have the opportunity to marvel at the Twelve Apostles, Lion’s Head, the ocean and Robben Island on a clear day. In the early morning, you’ll be shaded from the sun by the mountain, making this hike pleasant even on warmer days. Always remember to wear sunblock and a hat just in case and follow these hiking safety tips. Once you’ve reached the summit you’ll spot the “diving board” to your right where many pose for photos, but not to be attempted by the faint-hearted or on a windy day. On this track, you’ll also spot some remnants of the old Cableway, used to ship supplies for the construction of the dams to the top of the mountain in the 1800s. It’s just a few metal remnants, but the positioning will really make you appreciate the efforts taken to build the dams on Table Mountain. View a map of the hike. See our other suggestions for Table Mountain hikes you should try.